Our January 2017 Newsletter is now ready! You can read our newsletter by clicking on the link below. 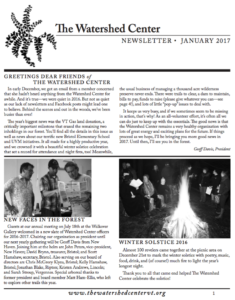 If you would like to join our mailing list just email your name, address, and email to info@thewatershedcentervt.org. Or fill out the sign-up form on our website.